A popular request from you, our customers, has been to enable auto-tagging of destination URLs so that you can track your paid search campaign performance in analytics programs, such as Google Analytics. I’m happy to announce that this feature is now live in Bing Ads. We know the importance of accurate reporting in site visitor analytics, and we’ve worked hard with our engineers to provide a feature that does all the heavy lifting of this simple task in an error free and consistent way across all the ads that are served on your account. Say goodbye to manually tagging the destination URLs of your ads with UTM tags and let Bing Ads handle UTM auto-tagging for you. We are launching our auto-tagging feature in the web user interface (UI) and API at the account level. 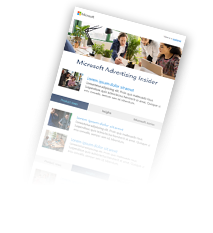 We hope this feature will help you to be more successful on Bing Ads, making it easier to reach the audiences you want. Sign in to Bing Ads, click the gear icon in the top right and select “Accounts & Billing”. When you have selected a specific account, you will be brought to the account details tab (shown below). If you have multiple accounts, select the account you want. Then, click the pencil icon next to the “Account” subheading. NOTE: If you a Yahoo! Managed advertiser, you will need to navigate to the “Advanced Settings” tab instead as shown below then click the pencil icon next to the “Account” subheading. 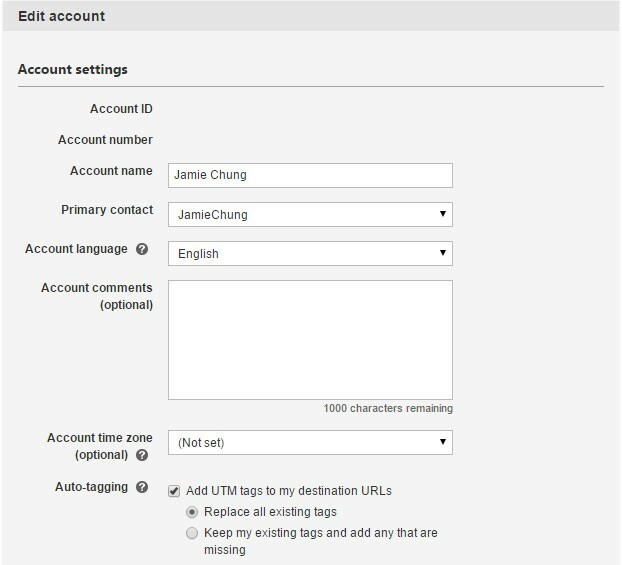 From the edit account view, you can turn on auto-tagging under the "Account settings" subheading. Further explanation of the various auto-tagging options are below. Auto-tagging is an account-level feature that applies to all campaigns under that account umbrella. If you have multiple accounts, you will need to enable auto-tagging separately on each account. Replace all existing tags: Use this option if you want Bing Ads to substitute the supported UTM tags across all ads served on your account. This will overwrite the values of any tags that you have manually placed in your ad destination URL and append the missing tags if there are any. Keep my existing tags and add any that are missing: Use this option if you already have existing UTM tags manually tagged with your ad destination URLs. You are currently reporting on these tags but you would like Bing Ads to automatically append any UTM tags that you are not reporting on. This option will give advertisers both backward compatibility with their existing reporting and also provide additional level of detail using our supported UTM tags. This option is available inside the Account data object. We have added another key to the ForwardCompatabilityMap property of the Campaign data object named: AutoTag. Set the value to 1 to have Bing Ads automatically append UTM tags and preserve your existing tag (Keep my existing tags and add any that are missing). Set the value to 2 to have Bing Ads automatically append the supported UTM tags and replace any of the existing supported tags (Replace all existing tags). 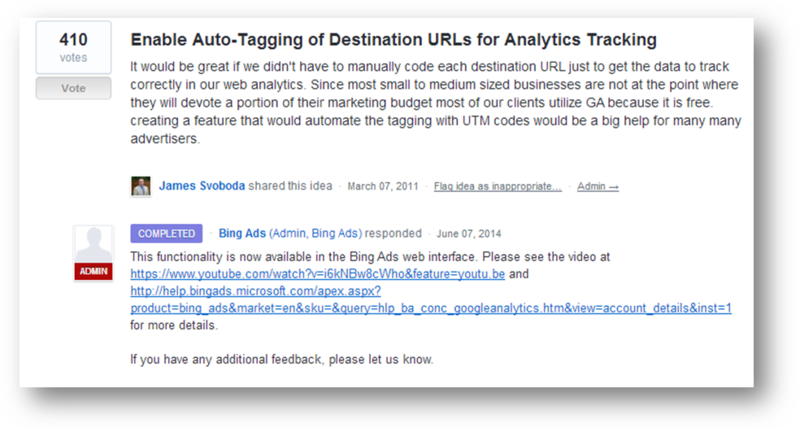 If I enable auto-tagging, will Bing Ads update all my existing destination URLs? It is important to know that Bing Ads only modifies the destination URLs at delivery time. What UTM tags are supported? The table below describes supported UTM tags and substitution values. If your ad or keyword destination URL contains other UTM tags, they will not be affected. How do I enable auto-tagging if my ads are managed by Yahoo!? Reach out to your Yahoo account managers and teams and they will enable this feature for you. Comments? Questions? Leave them below, or ping me on Twitter or contribute your ideas to our Bing Ads Feature Suggestion Forum.